FERVENT LOVE Fashion and Personalized Pierced Stud Earrings Acrylic Blue Fish Drop and Dangle Earrings are made of high quality, novel and unique design, compact, elegant. Suitable for all age ladies with any clothes on any occasion, It will make you the most shining person in the crowd. This would definitely a great gift choice for you loved ones. FERVENT LOVE is committed to provide the best product and services to our customers. Your satisfaction is the motivation for us to move forward. This amazing piece is a must have and best for your collection. Add it to your Wish List and keep an eye on the latest offers and promotions of FERVENT LOVE! If you have any problems with our products or services, please do not hesitate to contact us before you leave your feedback. We will do our best to help you solve the issue. PRODUCT MAINTENANCE: 1) Take off the pieces and keep it in a safe place before showering. 2) Avoid direct contact with heat, or expose under the sun. 3) Avoid prolonged contact with solvents or chemicals like perfume, hand cream and soap. 4) Clean in a secure location, not the rim of a sink where a piece in case it slips down the drain. 5) Remove dirt or particles by using only a soft brush, never sharp or hard objects. 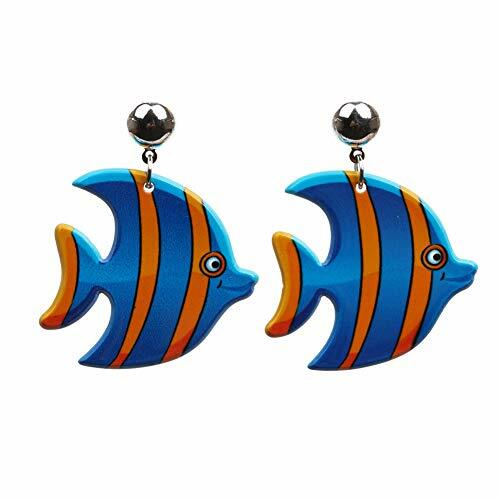 FERVENT LOVE Fashion and Personalized Pierced Stud Earrings Acrylic Blue Fish Drop and Dangle Earrings are made of high quality, novel and unique design, compact, elegant. Suitable for all age ladies with any clothes on any occasion, It will make you the most shining person in the crowd. This would definitely a great gift choice for you loved ones. FERVENT LOVE is committed to provide the best product and services to our customers. Your satisfaction is the motivation for us to move forward. This amazing piece is a must have and best for your collection. Add it to your Wish List and keep an eye on the latest offers and promotions of FERVENT LOVE! If you have any problems with our products or services, please do not hesitate to contact us before you leave your feedback. We will do our best to help you solve the issue. PRODUCT MAINTENANCE: 1) Take off the pieces and keep it in a safe place before showering. 2) Avoid direct contact with heat, or expose under the sun. 3) Avoid prolonged contact with solvents or chemicals like perfume, hand cream and soap. 4) Clean in a secure location, not the rim of a sink where a piece in case it slips down the drain. 5) Remove dirt or particles by using only a soft brush, never sharp or hard objects.